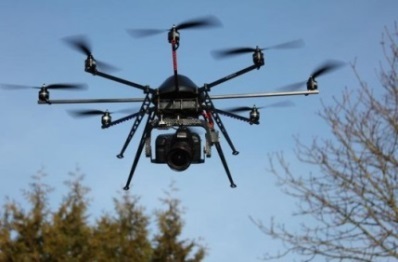 Unmanned aerial systems (UAS) technology and remote sensors are improving at a rapid rate. We attended a conference on Unmanned Aircraft for Remote Sensing Applications (UAS4RS) at the University of Queensland, Brisbane on 17-18 February. 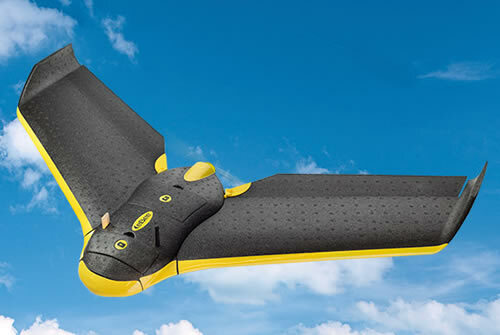 Our aims were to look at ways other researchers used this technology and to work out potential benefits remote sensing from UAS offers to our current and future research and extension. The conference’s presentations and discussion focused on the applications of UAS in challenging environmental situations including inaccessible terrain, vast areas, tundra, desert, and over oceans. We have many options to capture data. Field surveys involve sampling and monitoring but these are time consuming and focus only on small areas. Satellites are great at covering large areas; but they have low resolution and are affected by cloud cover. Aircraft cover large areas quickly but are expensive, affected by cloud cover and known to have risk on personal safety. UAS collect high resolution data on demand at a lower cost, are not affected by high cloud cover, and can easily get to areas inaccessible to researchers. Thus, UAS provide a link in multi-scale integration of plot-based field surveys with high-flying manned aircraft and earth-observing satellites. Dr Karen Joyce from James Cook University discussed the difference in resolution from each of these methods (Figure 1, below). 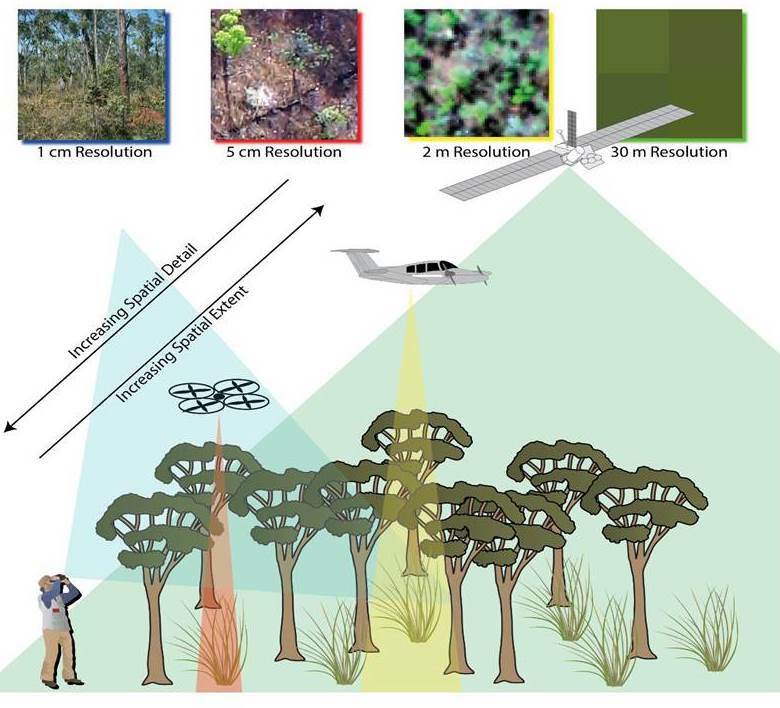 UAS is a promising tool in remote sensing of forest dynamics, pest and biosecurity threats, as well as monitoring coastal, aquatic, and agricultural ecosystems. Using multi-spectral cameras, UAS capture different image bands for use in presentation of true colour, near infrared or normalised difference vegetation index (NDVI), an indicator of crop biomass, health and available nitrogen. High resolution imagery over large areas allows monitoring of changes in population, density and ground cover as well as identification of pests in horticultural crops and forestry.This data can be fed into Precision Ag software to create paddock-based management systems. UAS can be fixed wing or multi-rotor. Fixed wing UAS are suited to flying long distances while multi-rotor UAS are suitable in areas where there is less space to take off and land. Selecting the appropriate sensor dictates the payload and gimbal setup needed. 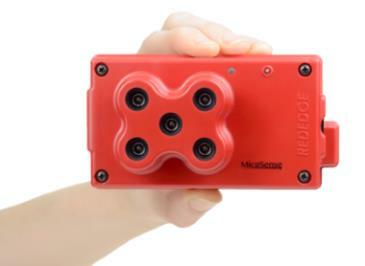 The MicaSense RedEdge sensor is a widely used multispectral camera while the DJI Phantom with a Go Pro modified for NDVI is the package of choice for many advisers and agronomists. 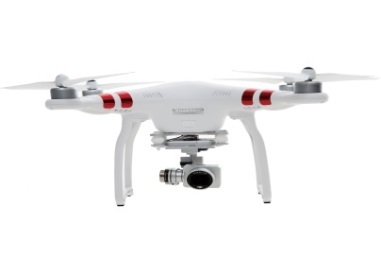 Flying UAS legally is currently the biggest limitation as anybody using a UAS must be licenced. Managing and processing data is a big issue as UAS collect massive amounts of data. Short flight time is still a challenge, even though batteries are improving rapidly. Sensors are large and running with more than one sensor is necessary to avoid the issue of co-registering data. But greater payload results in less flight time. We would also need more than one UAS unit because they are susceptible to crashing and being attacked by eagles. A spare unit is also important in case of system malfunctions, particularly in the harsh NT environment. Attending the conference was extremely worthwhile. It gave us an understanding of where current technology is and where it is heading. It was good to see how our colleagues are using remote sensing technology both in research and extension. It was also great to meet and network with staff from various state departments and universities from Australia and overseas. For NT DPIF to move forward in this field, we need to work with organisations that are already using the technology, have access to software and hardware, and are licenced to fly. Through this process we can develop the capacity of our own staff.